If you want to drive a hot new 2014 Ford Mustang and don’t want to buy one, there is good news coming from Hertz. The rental car company has partnered with Penske Racing to create a “hotter-than-hot” version of the Ford Mustang called the special edition "Hertz Penske GT." The new Ford Mustang was introduced on July 5, at Subway Firecracker 250 Powered by Coca-Cola NASCAR Nationwide Series race at Daytona International Speedway. Mark. P. Frissora, Hertz Chairman and CEO said, "Working with Penske Racing, we're excited to introduce the Penske-inspired vehicle as the newest in a long line of American muscle cars in our rental fleet, There's nothing more thrilling than hitting the open road in a high-performance, American-built sports car. With this addition to our Adrenaline Collection, we are introducing a vehicle with race car performance enhancements to give customers a unique travel experience." The hot new rental car will be available for rent at 15 Hertz airport locations around the country for up to $180 a day, or up to $800 a week, with an additional charge for more than 100 miles a day put on the hot Mustang. The rental of high-performance cars is big business for Hertz and the new Hertz Penske GT Ford Mustang gets added to the performance rental car “Adrenaline Collection” of Chevrolet Camaro SS, Dodge Challenger R/T, and Corvette Convertible. The performance cars rent at premium rates and it’s become a nice extra business for rental-car companies. And the new Hertz Penske Mustang should be a fun driver for performance enthusiasts. Those who rent the new Ford Mustang from Hertz will be treated to some extra performance upgrades from Penske. Penske Racing took elements from the 2013 Ford Shelby GT500 and the track-oriented Laguna Seca and came up with the hot new pony car. Penske gave it performance upgrades that include a performance air intake and quad-tip exhaust system, ECU engine computer tuning, 3.55 gears and Brembo brakes for more stopping power. The interior also received some special treatments like black Recaro racing seats, Laguna Seca gauge pod, limited edition interior dash and engine bay plaques, custom floor mats and door sills, and Ford's Touchscreen Entertainment System with GPS and back-up camera. The exterior will stand out from other Mustangs on the road and gets a black exterior with unique Hertz yellow racing stripes, Boss 302 front splitter and GT500 rear valence. Performance enthusiasts will enjoy the upgraded suspension and superior handling. The exterior also receives a custom graphics package, and custom Hertz faux gas cap. The final horsepower wasn't released, but we can bet it will be enough to smoke the tires. 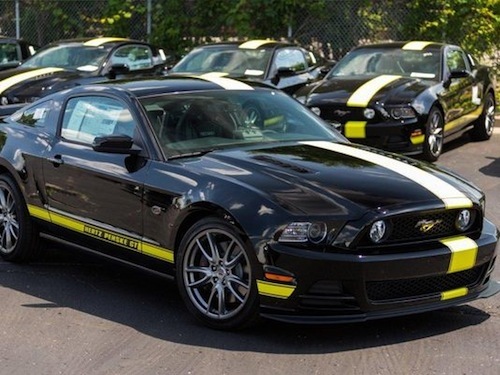 This isn’t the first time Hertz Penske GT has produced a hot Mustang as this is the third version. They created the GT350H Mustang in partnership with the late performance icon Carroll Shelby in 1966. And it created the GT-H in 2006 and 2007 and a custom Chevrolet Corvette ZHZ in 2009.They created a niche market for high-end performance cars that is still profitable today. Customers who are renting higher-end cars want something unique and special. Something that they don’t have in their own garage and can’t afford to buy. The Hertz Penske GT "doesn't shout 'rent a car,' " says Paul Sheldon, senior vice president of Hertz North America and a performance-car enthusiast. The black fastback coupe with a distinctive gold racing stripe and stripes on the lower sides that recall the old Shelby’s is "subtle ... not outrageous," he says. Hertz even rents a collection of Ferraris and Porsches and the Hertz Penske GT Ford Mustang will surely be a hit also. After Hertz is done with the cars, they will be sold at auction and they have become highly collectible with auto enthusiasts in the past. Some have fetched high dollar bids and this new Mustang from Hertz Penske will surely follow in that tradition. Only 150 examples of the hot Mustang will be produced. So if you want to drive one of these hot new Hertz Penske GT Ford Mustangs, look for them soon at an airport near you. Wait for a couple years, and pick one up at auction and it’s sure to be highly collectable.